Connected and Autonomous Vehicles (CAV) have the potential to bring huge change to people's lives, Scotland’s transport secretary has said. Giving the keynote address at the inaugural CAV Scotland event, organised by Transport Network on behalf of Transport Scotland, Michael Matheson MSP, said: ‘The Scottish Government very much supports the CAV industry and I am keen to understand how the introduction of these vehicles and technology can contribute to the Government’s purpose of sustainable economic growth, a fairer, more inclusive society, and our “Vision Zero” road safety goal. 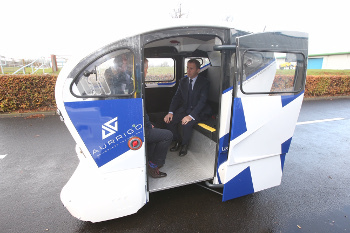 At the event, Mr Matheson took a ride an in AurriGo PodZero driverless vehicle. He told an audience of industry experts that he saw CAV Scotland as a forum for informative and exciting discussions on ‘how we can all support the future development and deployment of Connected and Autonomous Vehicles across Scotland’. He said: ‘The world of Intelligent Mobility is developing rapidly. Mobility-as-a-Service, Big Data, the Internet-of-Things and Connected and Autonomous Vehicles are just some of the disruptive technologies that will increasingly be pushing the boundaries of transport services. He said the Scottish Government wants the country to offer high quality test and demonstrator opportunities to developers and industry. He added that Scotland has ‘a huge amount to offer’ to those working in the CAV sector and has the potential to be an ideal ‘Living Lab’ for the real-world testing of these technologies.